We all love Chinese (Indo-Chinese actually) food, especially on cold evenings. So today we bring you a delicious recipe that nobody can say No to! Ingredients - 200 g paneer, 1/2 tsp ginger paste, 1/2 tsp garlic paste, 2 tbsp cornstarch, 2 tbsp maida, 2 spring onions, 1 onion, 1 capsicum, 1 tbs soy sauce, finely chopped ginger and garlic, vinegar, seasonings as per taste. 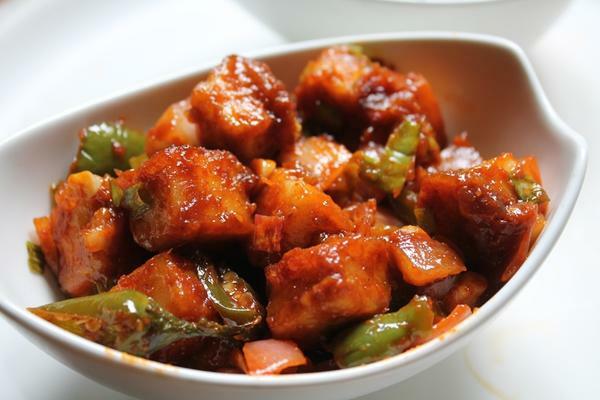 - Make a marinade for paneer cubes by mixing maida, cornstarch, water and seasonings. Gently put paneer cubes in the marinade, coating it all over. - Now fry the paneer cubes, place the cubes gently on a paper towel. - In a kadai, heat some il. Add chopped ginger and garlic. After a minute, add chopped onion. Fry for a few minutes, then add in chopped capsicum. - Add a little water. - Add in cornstarch-water mix to thicken the gravy. - Add salt, seasonings, vinegar and a little sugar. - Add the friend paneer cubes to this mix and coat all over. - Garnish with fresh coriander, and serve hot with fried rice. Care for a Vegetable Stew?